ENJOY THIS 'CLEAN AS A WHISTLE' DESIGN WITH MUCH LOVE THROWN IN! 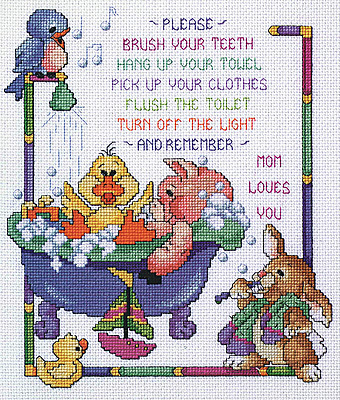 Follow the Bathtime Rules in this whimsical Counted Cross Stitch design by Stoney Creek Collection. Each kit contains 14-count cotton Aida fabric, 6-strand cotton floss, needle, graph and instructions written in English, French and Spanish. The saying on this design: "Please - Brush Your Teeth - Hang Up Your Towel - Pick Up Your Clothes - Flush The Toilet - Turn Off the Light - And Remember, Mom Loves You". Size: 10" x 12" (25.4 x 30.5 cm).